The life of a blog takes many twists and turns. From writing it for yourself to a fixation on stats, from not knowing the difference between a blog and a post (snigger, who doesn't know the difference between a blog and a post?) to knowing how to change html code and alt text an image, from simply clicking 'publish' to tweeting, google+-ing, facebooking, pinteresting and kindling your posts, from being thrilled at receiving a jigsaw to review to turning your nose up at a new leather handbag, from being one woman and a laptop to being one small part of an amazing community, from flailing around in the dark to knowing with absolute certainty where you are going...and then flailing around in the dark again. Can you guess that I'm flailing around in the dark again? 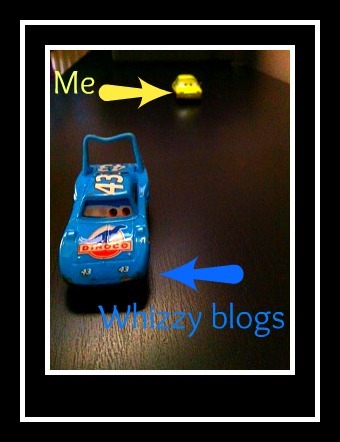 I feel like my blog has nose-dived. I'm not in love with it any more. I see lots of amazing whizzy self-hosted Ferrari-like blogs flying past me and despite wanting one too I just don't have the time or the knowledge for it, so I pootle along behind in my Morris Minor. So I'm going back to basics. For now 'marketing' my blog, upstyling it's design, going self-hosted, reading about new tips and tricks, and trying to stay in the fast lane is all on hold. I'll still be around Twitter and FB - but only when I have something to say - no more lurking! Listography will also be retired to the backseat of the banger - for awhile at least. Instead of weekly outings she'll be allowed in the drivers seat once a month only. I might even get to clean the house or feed my kids. Basically I'm going to just concentrate on the posts again. Because really that's what makes a blog. See? They're not that different after all.